The Unsettled spread in El Tecolote. A writing project that set out to tell stories about the Mission’s past is now becoming a published series — and it’s excavating previously untouched historical ground. Adriana Camarena, a writer and activist living in the Mission who grew up in Mexico, is interested in what she calls people’s “personal truths about themselves” — how people define themselves and their circumstances. 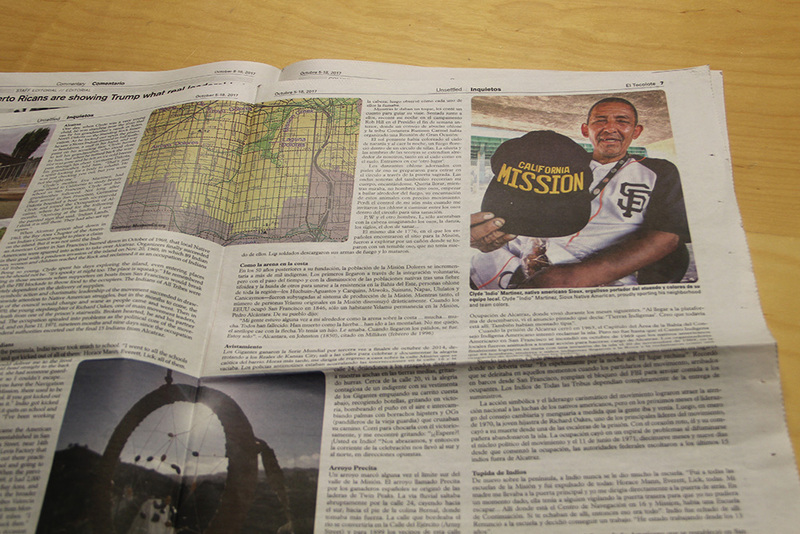 Camarena is now digging a little more deeply into the Mission’s past with Mission Unsettled/Inquietos, a seven-part series to be published as inserts in the neighborhood’s bilingual newspaper, El Tecolote. “One thing people don’t realize is … there’s not a lot of research done about the Mission,” she said of her project. She ought to know — she lives with Chris Carlsson, director of the Shaping San Francisco historical organization and online archive. And she’s spent more time than most poring over old Spanish documents, library records, land-grant deeds — you name it. Political movements, the neighborhood’s Latino heritage, the marks left by missionaries, and post-Gold Rush history have been explored at some length, and Cary Cordova’s recently released book, The Heart of the Mission, helped, too. But much is left to discover, Camarena said, like the stories of various Native American groups in the area. On walks with Carlsson, Camarena encounters what she called “echoes of the past,” and she’s listening closely. Not just out of curiosity, but because the past can help us understand ourselves. The parallels present themselves readily. “The more I read about San Francisco in the 1800s, the more things stay the same,” she said. In her first essay, published in the October 5-18 edition of El Tecolote, Camarena tells the story of Indio, a Sioux man she encountered on the streets of the Mission, who participated in the Native American occupation of Alcatraz in 1969 to 1971. Indio’s path through life has a similar cycle, leading from one unsanctioned occupation of land to the next — in his childhood, it was Alcatraz. Now, as a homeless adult, it’s the freeway underpasses along Cesar Chávez Street, where law enforcement regularly move around those who take shelter there. Future essays will examine displacement through the ages, redevelopment and Latino identity — from day laborers to little old ladies at the laundromat. “People want to look back at their roots,” Camarena said. By thinking about what the Mission used to be, used to look like and even used to smell like, she’s hoping to make people think about what kind of a city a diverse population can build, what that means and what it would take to protect diversity in light of history. Looking back can also mean reexamining the present, and our own role in it. “I want to get Latino populations to think about our histories,” she said. She also wants them to reexamine established identities with a little bit of irreverence. The project is funded by the Creative Work Fund, and the stories will appear every three months through January 2019.